Migatronic Omega² - a flexible and state-of-the-art machine range. Migatronic Omega² - a flexible and state-of-the-art machine range. 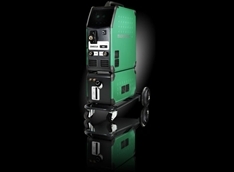 The Omega² welding machines range from 220 A to the large Omega² 550 A featuring gouging.The machines are targeted at manual and manufacturing industries; easily operated, infinitely variable and fully digital welding machines featuring reversed polarity and two optional control panels, the manual Basic panel and the synergic Advanced panel. Omega² machines for every need The Omega² range is quite flexible: Five optional power sources and two control panels, manual or synergic. The Omega² is available as a C version (compact) or a versatile S version (separate wire feed unit) with a turnable and detachable wire feed unit and replaceable interconnecting cables. The Omega² 400 and Omega² 550 are available with water cooling. The IGC® (Intelligent Gas Control) is an optional feature in all models, ensuring largescale gas savings and optimal gas shielding in all current ranges. At Migatronic the keyword is quality which is manifested in the company’s objective to supply high-quality products meeting customers’ requirements as well as to give qualified advice and develop state-of-the-art welding technology focusing on environment and user-friendliness. As part of its ongoing focus on supplying optimal welding solutions to the oil and gas industry, Migatronic has become a certified supplier in the Achilles Joint Qualification System. Since 1990, Achilles has built up an impartial and internationally recognized quality management system which today is a supply chain network comprising more than 700 market-leading companies in several industries and 55,000 certified suppliers worldwide. In order for a company to qualify for an Achilles JQS certification, documentation must be provided that the company’ s products and services match internationally standardized quality demands. - Migatronic’s JQS qualification is based on our long-time ISO 9001 certification and our focus on purposely and continuously supporting and developing quality throughout the group, says Migatronic quality manager Niels Lønstrup. In commercial terms, Migatronic is confident that this certification will open more doors in the oil and gas industry. The company sees potential development opportunities as a supplier to major manufacturing companies and not least many of their sub-suppliers. Especially for the offshore sector, Migatronic has great expectations and has developed a range of welding machines matching all safety requirements for heavy-duty applications. Read more about the Achilles quality system and certification requirements on www.achilles.com.